The thin-film solar leader is betting its future on the bigger Series 6 cadmium-telluride solar module. The two big U.S.-based vertically integrated solar manufacturers have been going through restructuring efforts in order to cope with this industry's weird year of transition. Both SunPower (the high-efficiency silicon solar cell leader) and First Solar (the thin-film solar leader) have laid off staff, optimized manufacturing and rejiggered their product mix. Both companies lost big piles of money in 2016. First Solar is betting its recovery on the success of its new larger-size Series 6 solar module and just reported its financial and operational results for 2016, while forecasting its business for 2017. 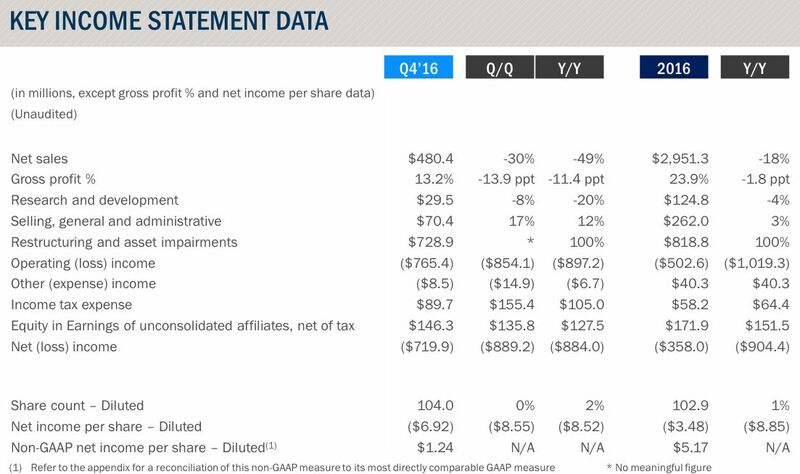 First Solar posted Q4 2016 revenue of $480 million, compared to consensus of $404 million. It was a drop of $208 million compared to the previous quarter. Gross margin was 13.2 percent compared to Street consensus of 22.8 percent, due to project timing and mix, a symptom of this often lumpy project-based business. For 2016, net sales were $3 billion versus $3.6 billion in the previous year. For 2016, gross margin was 24 percent compared to 26 percent for the previous year. Fourth-quarter module production was 760 megawatts-DC, a decrease of 2 percent from the prior quarter due to production being halted on certain lines in Ohio related to the Series 6 transition. Ending cash was nearly $2 billion. 2016 full fleet average was 16.4 percent, while best line efficiency exited the year at 16.9 percent. The company is focused on reaching greater than 18 percent efficiency. Although undisclosed, First Solar "met and even exceeded the module cost per watt target," and cost per watt decreased by 16 percent compared to full-year 2015. 2016 bookings total amounted to 1.8 gigawatts, and 400 megawatts have been already booked in 2017. First Solar looks to begin booking Series 6 in late 2017. 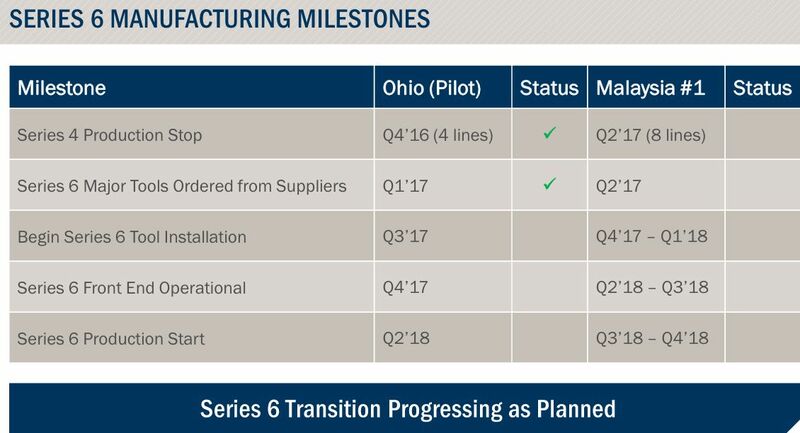 According to the CEO, "Near the end of last year, we stopped production of four lines at our Ohio factory and began preparation for the installation of our Series 6 pilot line. At this point in Q1, we have placed orders for the large majority of the tools including all the major equipment required for the initial pilot. With regards to our Malaysia factory, we will be stopping Series 4 production on eight lines within the next two months." The company contends that its "Series 6 module will utilize essentially the same underlying solar cell technology as our Series 4 product. Given this, we believe that core technology risk involved in the transition is low. The analogy we have used in the past is that this is similar to...how the flat-panel display industry scales from one generation to the next. We are not reinventing the core technology behind Series 6, but rather increasing the module form factor." "Intensive validation of the elements of our Series 6 design has already begun, including, among other methods, utilizing accelerated life testing and field exposure testing." First Solar suggests that average selling prices have started to stabilize. First Solar raised 2017 revenue guidance to $2.8 billion to 2.9 billion up from a range of $2.5 billion to 2.6 billion, versus a consensus of $2.53 billion. The guidance, however, is weighted to the second half of the year. Oppenheimer writes, "We continue to believe that FSLR shares are highly dependent on the success of its Series 6 technology ramp and cost structure. We are encouraged to see the company point toward potential for lower than $0.30/W in capex for Series 6." 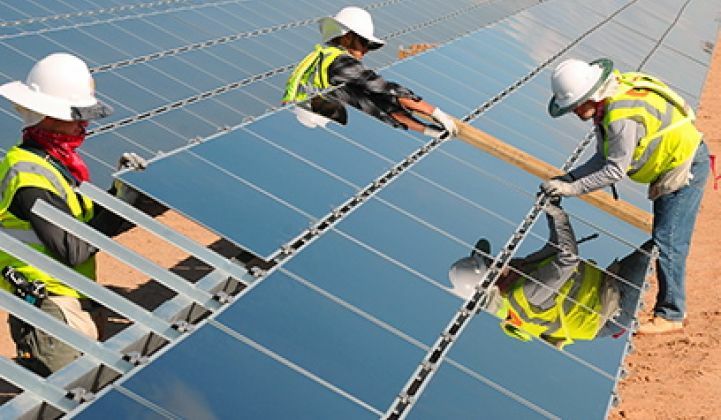 Julien Dumoulin-Smith of UBS called the results a "mixed bag of updates" and writes that First Solar is "largely about execution on book-to-bill going forward. While data points on pricing remain cautious, the latest data points on Chinese demand and correspondingly higher poly prices have helped drive renewed vigor in the panel market." UBS adds that China demand "could effectively reach 30 MW to 40 MW or higher in 2017, which could actually act as a significant swing factor for global supply/demand and potentially help ASPs. On the other hand, we note the 30% price decline last year took place even with substantially elevated China installs playing out, suggesting a new kind of boom-bust mini cycle could become the norm centered around subsidy cuts in China and largely drive both scale and competition in the Chinese market, which would likely bleed through to other markets during the 'down' time as policy is reset." UBS notes that while First Solar's "customer base is enthusiastic about the new product, silicon ASPs in the high 20s or mid to low 30s at best worldwide today indicate a potentially continued competitive environment even with low-20s costs for Series 6. Ben Kallo at Baird Equity suggests that the First Solar is the stock "to own in a challenging environment." He adds that the firm's thin-film technology "is receiving premium pricing in select markets, and we believe [First Solar] will remain a cost and technology leader over the long term."